It was warmer for the final day of July with progress in the new Wirksworth Booking Office. Compound has been put between the edge of the new flooring and the walls to fill the gap. Also on the station, the team made much progress with the toilet refurb. It has become clear that the walls which support the furniture in there aren't strong enough so some boards are being inserted. A lone ranger worked on the yard point project and the crests were applied to EVRA's SK. A team worked on No3 to ensure it can continue service too. Steelwork repairs to the PW Bubble have been progressing well this week after the dome has been removed at the front. New metal is being inserted before the dome can go back. The driver of the service train ended up driving four different vehicles due the class 31 misbehaving and the MD failing to fuel the Class33.Probably never been seen before but the 31 worked 1st train, Three car DMU 2nd, Class 33 third and 55006 fourth. Good for the Gricers !! A view of the new pointwork as this project progresses well. I have been asked to report on today's goings on as Mike has a prior engagement. Today was somewhat steadier than yesterday but still good for a Wednesday with all services being ably handled by 33103 "Swordfish". The scale running of a diesel locomotive in the midweek is very much an experiment but so far has proved reasonable with quite a few people taking the bait. If nothing else, it has given the DMU Fitter chance to cure the electrical issue on 51505 and put that back in to traffic, after the cause of the fault was discovered yesterday. The P Way team worked on the turnout to the new shed road once again and this projectlette is coming on leaps and bounds. A couple of members were purloined for the commencement of the refurbishment project of the Wirksworth Gents Toilets. Of course normally P normally stands for Permanent but in this case it could mean something else! The refurbishment will be a major improvement and will help make the facilities satisfactory until one of the floors of Wyvern Towers can be converted into something more permanent going forward. Lining out of the EVRA SK was carried out in the Engineerium and we look forward to the introduction of this vehicle to traffic soon. 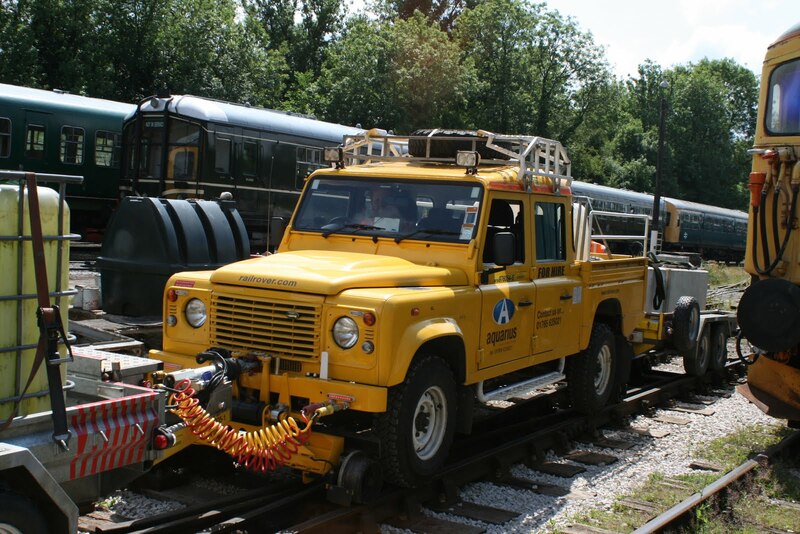 The first day of our diesel week, where all our service trains will be hauled by a diesel loco, kept everyone busy. The DMU group identified 51505's electrical fault which had been causing problems. Ingress of water into a junction box had caused corrosion to terminals. Two photos that show today's test customer hosted by Tony Watt and the continued endeavour by the Permanent Way Team with the Spondon point. For those that are interested today saw the opening of the new tram stop above Nottingham Station with admirable connections to the trains below. A dry start to the day as the 122 Bubble looked after the Wirksworth -Duffield service with average numbers until the heavens opened up and Wirksworth was once more deluged with rain as our passengers deposited themselves in the Pullman buffet for hot food and drinks. 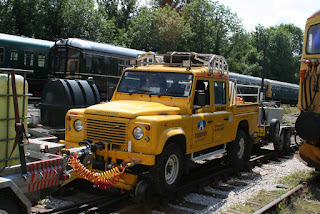 No3 worked the incline service and was also used for the s team driver experience . 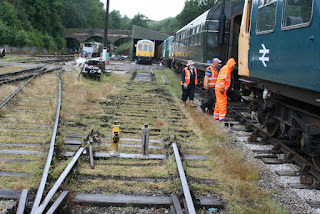 Down the yard the Dmu group were kept busy checking the final drive on the 108 as well as changing its vacuum pipe. 50253 received more drilling and screwing as it renovation continued. The class 31 had its flux capasitator changed and the engine run up . Thank you to all the staff who made it an enjoyable day for our passengers. A very busy day at the railway as final preparations were made to the 3 car which was to form part of the 14.15 service and then transport our wedding party from Duffield to Shottle on the 15.15. Iris and the 122 Bubble car formed the main stay of todays service until Iris decided not play and failed to form part of the 14.15 service but in true form our quick fix fitters Leigh Mike Ben Joe and Rob were soon sorting out the electrical fault and by close of play had it fixed . The station Played host to the Royal British Legion and Patriot group who are building the locomotive to be named the Unknown warrior. 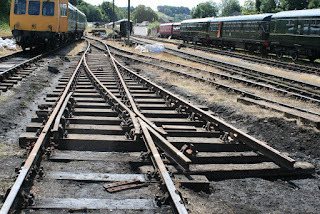 Down the yard the Dmu group worked renovating 50253 . The 8f group ere busy drilling out the top stays out on the Duke with Tim Oaks. Derek was kept very busy washing all the pots from the last nights successful Dining train with yet more very happy passengers congratulating the train crew . The Pullman Buffet was open and fairly busy as well as the model and miniature railways. Another good day was had by our passengers which is all done to you working hard my thanks to you all. Officially it's John's turn to do a report but as he didn't roll up until after midday I thought I would chip in. Actually, to be fair, he was booking on for this evening's Shottle Soiree dining train. Tonight is the final one of six Friday evenings. They have been a steep learning curve and have put a great demand on all involved but the customer feedback has been excellent. Plans are now afoot for a "one night only" Soiree later in the year. Team Tait spent all day setting up for the wedding reception party of Kaye and Matthew who are travelling from Duffield to Shottle. I'm not posting any photos here though as they may see! The LMS Patriot project erected their gazebo for tomorrow's Royal British Legion Day which added to activities too. Graham and Chris ably hosted four Drive a Diesel guests today. Feedback was excellent and the staff were commended by the customers for their knowledge and demeanour. The Catering Dept provided lunches inbetween baking tonights tarts. The rain held off so Dan was able to progress with his resurrection of the picnic benches so they're nice for the customers. Further progress on the B Exam of 51073 was made with many items ticked off the list today. Just need the PW gang to put the point in now so it can come off the pit. Actually, they were there working hard on it today and they've done amazing work already as the components only arrived last week! Pointwork from British Celanese Spondon being introduced to its new home. 55006 decided it did not want to work the1015 to Duffield after working faultlessly yesterday evening on vegetation clearance. Iris was quickly prepared and covered the service. 55006's vacuum release valve was replaced and it worked the last three services. All departments recorded improved takings from yesterday. The narrow gauge steam engine was taken away having disgraced itself by not working any trains. Dan keeps plodding on repairing the wobbly picnic tables but the public are certainly enjoying the additional seating on our platforms. Iris once again pottered up and down to Duffield handling our service train supported by the EVRA shop and Pullman Buffet. A large Pway group moved forward laying pointwork for the turnout to the number three road in the Maintenance Facility. The new fuel tank and waste oil tank now in position in new fuel point. Ben and Dan can now be seen assembling a new bench in honour of Alan Conway which will be positioned on the Platform 2 extension. The picnic area disappeared today with the fencing being removed and recycled. The PWay team stacked sleepers removed from the pit road and emptied the rudd of bags from Spondon to the new pway dump. 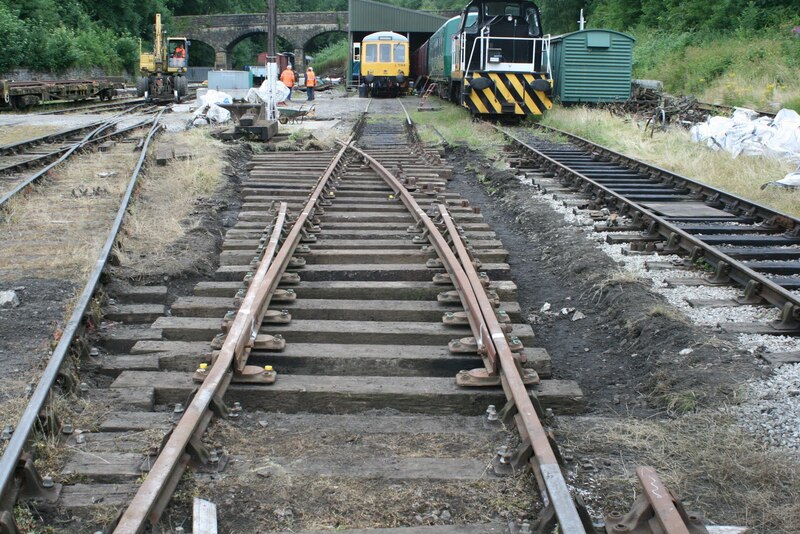 The track bed for the new turnout was also dug out. 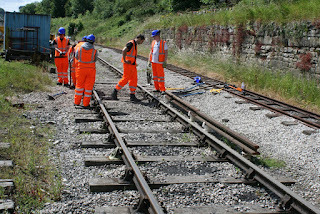 A couple of photos one of which shows further trackwork modfications commencing to provide the lead into the third road of the Maintenance Facility which will be aided by material recovered from British Celanese at Spondon. The second shows Joe and John tending to the newly painted EVRA SK (Second Coridor) coach. A nice sunny day kept us all on our toes as our passengers enjoyed the 2nd day of the classic vehicles rally as well as taking advantage of the free bus service which toured the area around Carsington water. 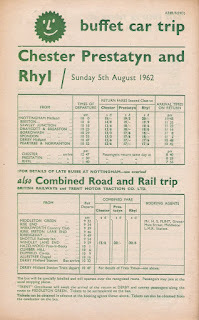 The train service was busy also as the three car ran between Wirksworth and Duffield. The Incline steam service ran with Brian Harrison propelling 505 .which brought quite a few extra passengers to the railway. The Pullman buffet and the tea/coffee service at Duffteld were both kept very busy through out the day. Many thanks to all the staff who kept the train service running today..
Dan was seen repairing a couple of picnic tables which have been removed from the picnic area and relocated to Platform 2 and Platform 1. Iris pottered up and down to Duffield easily coping with the Passenger numbers whilst the EVRA shop and Pullman Buffet received a steady stream of customers. The PWay team had a good housekeeping day sorting all the S and T spares stored near road 3 and moving them to a new location. As part of the Maintenance Facility reorganisation road 3 will be relayed. 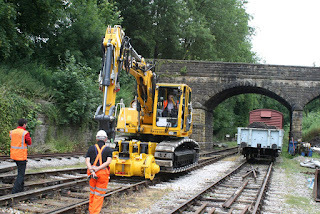 The Multicar weed killer was in operation in Wirksworth Yard and on the Incline. Another production from the studios of Cecil B de Miller grabbed whilst operating Gorsey Bank gates today for the late running 1415 Wirksworth to Duffield. 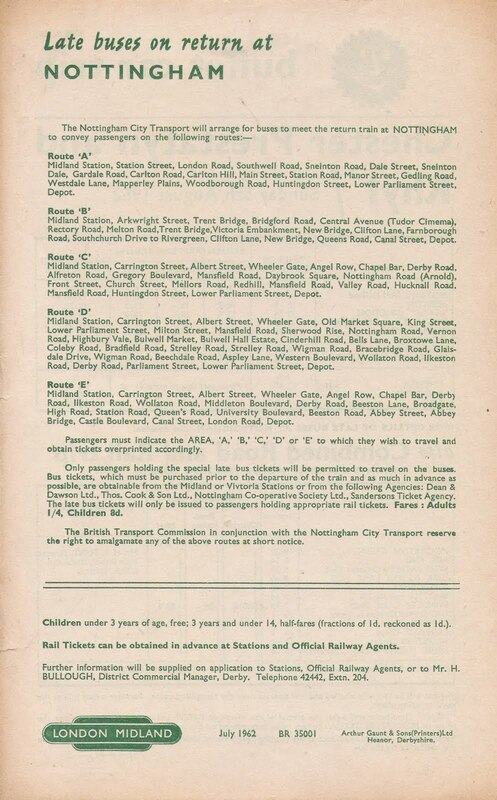 The scans attached are from 53 years ago when Wirksworth station was an excusion booking point albeit for a connecting bus service! A wet start to the day as the heavens opened with a heavy downpour soaking passengers and staff alike as 55006 worked the Duffield service which still produced a steady stream of passengers . The steam engine Henry Ellison was out early as we entertained E vras steam driving experience guest and his family which included one of our youngest ever guests at only 14 weeks old with her mum and brother . Down the yard the only activity was the Dmu group who completed more work and running trials on the engines and exhausts of 50253. 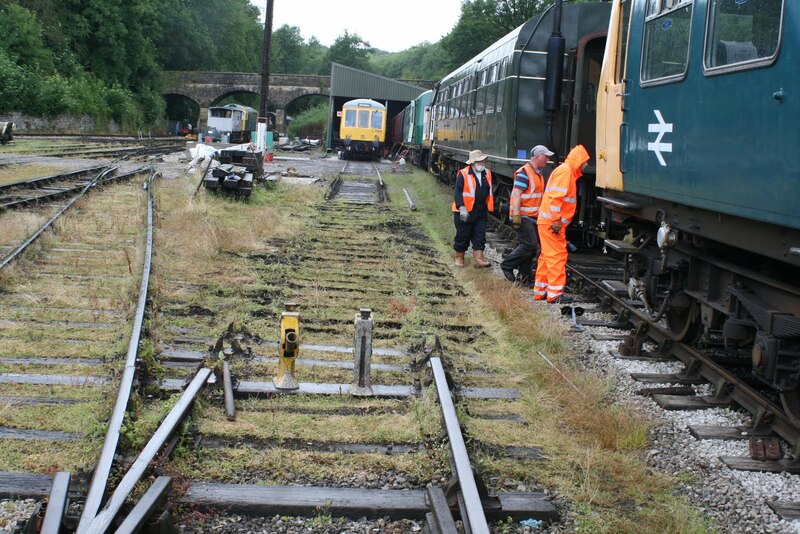 Many thanks to all the crews who ensured the passengers enjoyed their Journey between Wirksworth - Ravenstor and Wirksworth - Duffield . A lovely sunny day as we prepared for our fourth dining train to Shottle. The station foreman and his lone worker tackled repair work on the station. 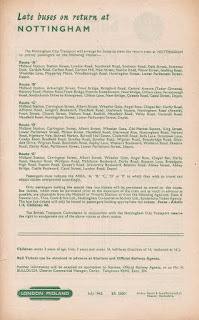 The booking office was kept very busy with dining train and general enquires. Joe looked after todays test customer as they moved between Wirksworth and Duffield. Dave, Will and Jacob prepared Henry Ellison then moved the coaches over to platform 2 ready for the catering team to load the food for our dining guests. We left shortly after 7 took a steady 8 mile an hour journey to Shottle where we ran round the train and allowed our guests to disembark and have their photos on the loco . We arrived back into the station at 2145 said goodbye to our very happy dining guests before the arduous task of disposing and general tidying of the train commenced . Many thanks to all the staff who made this enjoyable evening possible especially Owen who stepped in as 3rd man. Becoming a shareholder of WyvernRail has just become easier! Join ShareSave and invest in your railway for just 10 Pounds a month. 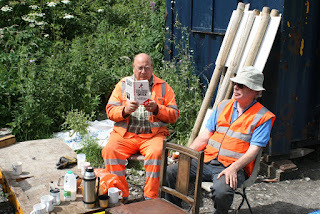 It's tough out there for the Permanent Way Team as they wait for the next delivery from Spondon. After the excitements of the last few days today was much more down to earth. We've been very busy of the last few days and today was a bit more sedate on the passenger numbers, but it did allow some catch up to be done. The keen-eyed amongst you, or perhaps those who prefer it to the television, will have noticed that the webcams were offline for about 24 hours this week due to a network fault. After exhausting internal spares it was necessary to get man with fusion splicer in to reterminate the connections before any sort of attempt at getting it all back working could be made. Seems to be holding steady just now! Back to today and much admin catch up was made as the network fault took up much time and diverted attention away from other things. The DMU fitters attended to both the B examination on 51073 and also the rebuilding of a spare engine which should be destined for 50170 reasonably soon. We welcomed one of our regular test customers who were out and about in the yard with two different coloured road/rail vehicles. Upon noticing an armada of lorries heading down the B5023 this morning, it reminded me of the impending delivery of reclaim track materials. It has been a mammoth task but is now nearing the end! 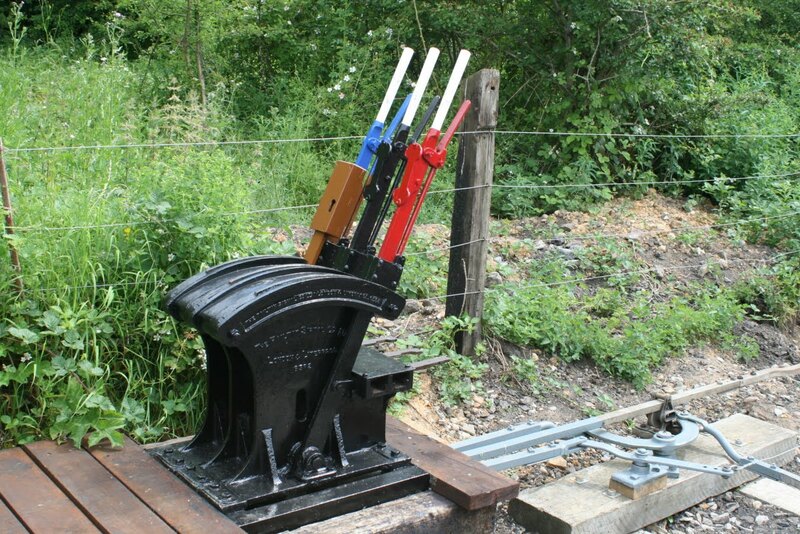 The last supplementary showed today's customer ably looked after by Joe and the electrification project is shown now! 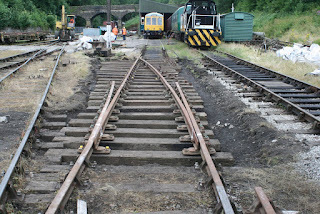 Electrification of the Midland Main Line may have been paused but the alternative 3rd rail system has started at Wirksworth. The Pullman Buffet hosted 55 over 55's who arrived by Coach, had a lovely large mouth watering Buffet and then travelled on the 1415 to Duffield and return. 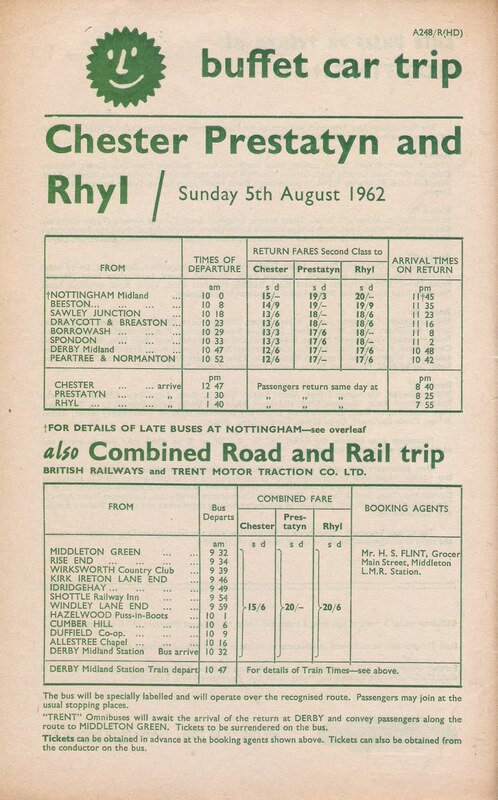 One of these coach trips each week would help to keep the Railway coffers mounting. With so many tasks being performed around the Railway it's easy to forget some. 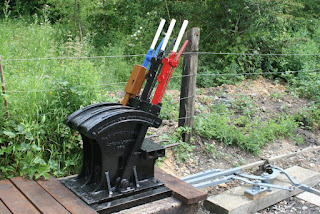 Dave Newby has been wiring the Tannery ( new booking Office ) and EVRA mounted some new metal gates on the Ballast dock. 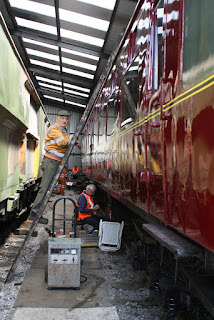 The DMU duo started 51073's B Exam which is quite extensive, involving oil changes and checking most major components. The PWay team were at Shottle clearing an area for the reclaimed materials which will be delivered from Spondon Thursday and Friday. Tuesday usually brings a large contingent of volunteers to the Dream Steam Team and they were drawn in many directions. 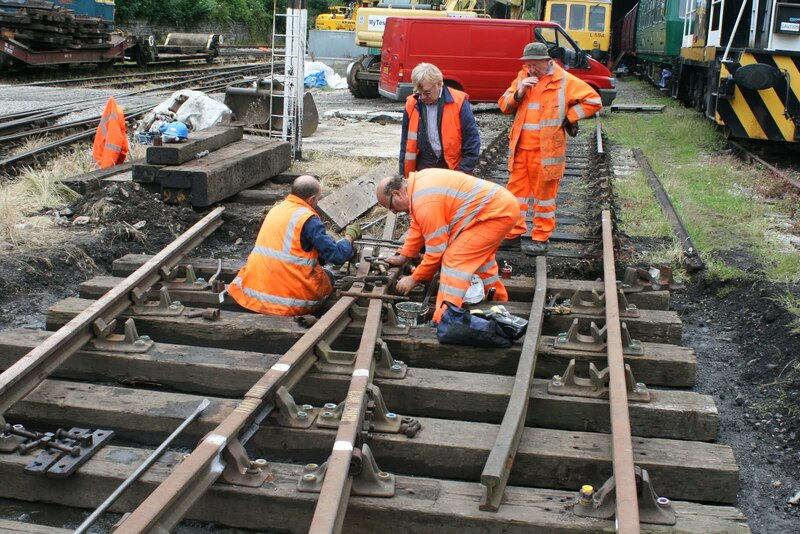 Some assisted the crew trying to repair the narrow gauge steam loco and others worked on Henry Ellison to ensure it will be fit to run Friday. Catherines frames were sanded ready for another coat of paint to give it a depth of shine. The DMU team started to unravel the electrical problem causing 51505 not to work to work with its mates and fitted two refurbished doors to 50253. A lovely sunny start to the day brought the crowds to the railway to ravel on our trains and some of the 15 heritage buses that had turned up for the second day of the bus gala. The buses ran a shuttle service around Carsington which took in the spectacular views it offers as well as running a service to Duffield which allowed our passengers the option of traveling by bus and train . The 3 car unit looked after the Duffield service which had a steady number of passengers all day whilst Henry Ellison was used on the incline service firstly with our drive a steam train experience trainee before looking after the regular days service. The Pullman buffet was extremely busy as our passengers enjoyed the hot and cold food that was on offer. The class 33 ( 33103 ) was run up and checked ready for hauling the Tuesday cream tea service train. . The spitfire was seen from a distance as it attempted to find the railway looks like more map reading exercises for the Raf but credit due to them as they do have so many fly pasts to carry out each day ..
Martin and Eric stepped in and looked after the Wirksworth Booking office all day . A extremely good day was had by our many passengers, so many thanks to all the staff who worked so hard to achieve this . A lovely sunny start to the day as we prepared our third Evening Dining train to Shottle which again is fully booked. The Station foreman and his crew tackled the grass at the side of the Ravenstor ground frame as well as completing further work in the tannery. The lone Dmu member was busy preparing the 3 car unit for use on tomorrows service. More buses arrived for this weekends Bus gala. The training room was in action as the Railways directors held their monthly meeting. 55006 was back on the service train and even the Pullman Buffet decided hot food was of the Menu. 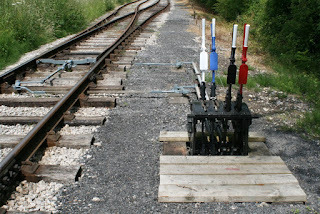 A couple of photos of the Ground Frames that now control Shottle Loop offering the tantalising prospect of two train working on high days and holidays.